One of the largest challenges of the modern churches is to activate the men. Most guys associated with Christian homes are merely warming a seat on Sunday mornings. Many are not even regular in attendance. How can you win a battle when your soldiers are preoccupied with personal ambition and pleasure? We must activate our men. Inspiring men into the Christian battle for the defense and the furtherance of the Christian faith will bring the greatest possible reward. As head of households Leading men is equivalent to leading families. Audio: "As for Me and My House"
Failing to Place the Emphasis on What God Has Commanded. Video Highlights: If every man in a church pairs up with another man to have regular, private meetings to sharpen one another with friendship, study, encouragement, and accountability, but the men do not teach their wives and children the Scripture on a near daily basis, then the church has a failed men's ministry. How can I say this? The Bible commands one but not the other. We see examples of pastoral training through intense, long-term mentoring (e.g., Jesus to the apostles and of Paul to Timothy, Titus, Silas, and others). We find examples of the saints extending hospitality for fellowship from house to house in the opening of Acts. However, we do not have commands or directives in the Bible that say that men must have one-on-one weekly accountability meetings. You may ask, "Is not one-on-one mentoring good?" Absolutely YES! Thousands upon thousands of men have matured into much stronger Christians through a regular Tuesday morning breakfast with another brother in Christ. However, there is a difference between failing to do something that is beneficial versus failing to obey what is commanded. One is a forfeiture of benefit; the other is direct sin. God commands that every father earnestly (or, the actual word in Deuteronomy is "diligently") teach his family on a daily basis. "You shall TEACH them DILIGENTLY to your children, and shall talk of them when you sit in your house, when you walk by the way, when you lie down, and when you rise up" (Deuteronomy 6:7). (See more verses here.) I would be happy if not one man in all the world attended a Wednesday night church services if the reason for their non-attendance was because Wednesday night meetings interfered with their regular nightly Bible studies with their families. We ought not to emphasize a men's ministries model built upon men routinely meeting with other men while largely ignoring the duty of fathers to minister daily teaching to their wives and children which is commanded. Success in God's eyes is not graded upon whether we are obedient to the trends of the day in a good cause. Rather, God grades obedience to the commands of Scripture which are the best cause. Allen Wolfe (www.BalancingTheSword.com) offers a few basic suggestions for starting your family worship (e.g., Stacy family). Recommendations are specifically for men who have little to no knowledge of the Scripture. A man’s ministry to his family is commanded by God, but many husbands and fathers feel unprepared or overwhelmed. 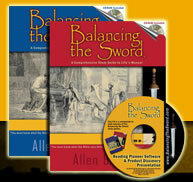 Allen Wolfe speaks of the essential nature of the Bible (i.e., the sufficiency of Scripture) and the limited benefit of all other study aids, including Balancing the Sword. Video Highlights: Part 1 of 2: In part one, Allen speaks of sola scriptura, selecting a Bible translation based on readability, preparing for the Bible study, the Bible on audio or video, and study Bibles (e.g., the Scofield Study Bible, the Ryrie Study Bible, the John MacArthur Study Bible, the ESV Study Bible, the Reformation Study Bible, the Geneva Study Bible, the Life Application Study Bible, etc.). Video Highlights: Part 2 of 2: In part two, Allen speaks of the Matthew Henry Commentary, on-line tools, Bible dictionaries (e.g., Smith's Bible Dictionary and Easton's Bible Dictionary), the Strong's Concordance, retailers who promote products over the Scripture, the Balancing the Sword books, the BTS questions and illustrations, interaction, creating a Bible reading plan, the BTS Reading Planner software, general study tips, and the importance of the Scripture coupled with sustaining desire.